ClearSpan creates parks and recreation building solutions that can be quickly constructed and at lower cost than wood or red iron buildings, making them the perfect option for municipalities. Our unique designs provide space for any application, and with plenty of clearance and the absence of internal support posts, these structures provide the maximum amount of unobstructed, usable space. Eliminate event cancellations with a year-round building that protects inhabitants from harsh weather, and with a welcoming environment that features the finest acoustics, everyone will appreciate a ClearSpan parks and recreation facility. 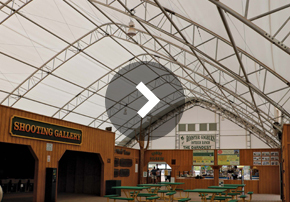 Whether you need a building for convention centers, camps, exhibit halls, indoor sporting space, concerts or anything else, ClearSpan has a building for your exact parks and recreation need. Maazel trains young musicians to perform at the Castleton Music Festival in Castleton, Virginia. In order to hold this festival at the farm, Maazel and his team needed to build a facility that could be outfitted with systems to keep the audience and performers comfortable, yet still be aesthetically pleasing. Director of Production John Harris was assigned the task of researching options for the venue and decided on two Hercules Truss Arch Buildings to serve as the music theater and Castleton Festival Café. Harris determined that an outdoor amphitheater or tent would not work for this application because they would not properly capture the sounds of the symphony’s music. Also, the music festivals are held during the hot Virginia summers, making total enclosure and air conditioning a must—two features a tent or outdoor theater could not offer. 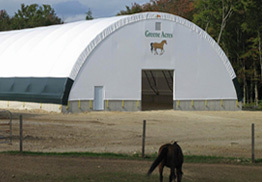 For more information on the Castleton Festival and their ClearSpan Fabric Structures, visit www.CastletonFestival.org. Our parks and recreation buildings come in fabric, hybrid and metal buildings, ensuring that no matter how you plan on using your ClearSpan structure, there is an ideal option.